Grace's produce my favourite tomato sauce, which is their Hot Tomato Ketchup. When I saw this tin of Mackerel in Tomato Sauce with Hot Chilli by Graces, I just had to pick it up and save it for a rainy day. It had two of my favourite things inside it; Grace's Hot Tomato Ketchup (or something like it anyway) and of course; mackerel. Feeling rather hungry one lunchtime I decided to open the tin. I had some bread for dipping and a tomato cut up on the side. There were some left over slices of beef in the fridge that gave me an ideal opportunity for some surf 'n' turf action. On opening the fully packed tin I prized out the three big fat lumps of fish, which initially dictated three portions for three people or one portion for one big fat greedy person (like me). The tomato sauce had a fishiness from the mackerel and a medium heat from the added chilli. The sauce was very tasty and reminiscent of my favourite Grace's Hot Tomato Ketchup (discounting the fishiness). After my first taste of the sauce I just knew that I'd need more bread to mop up all of the red tomato chilli sauce. I took a big chunk out of one of the lumps of fish. It melted in my mouth and made me groan a little with pleasure. The tangy chilli heat warmed my mouth and left it tingling for another piece. After a while I noticed my nose had started to sweat a little from the chilli heat. This reminded me of the times when I'd added English Mustard to the can of pilchards in tomato sauce as a child to give it a bit of wellie. This Grace's Mackerel in Tomato Sauce with Hot Chilli definitely had wellie and then some. Although I did have an "eyes bigger than tummy" moment towards the end of the meal! 400g tin, per 100g at 222 calories, with 1.3g of sugar and 4.4g of fat. Produced in Ireland. 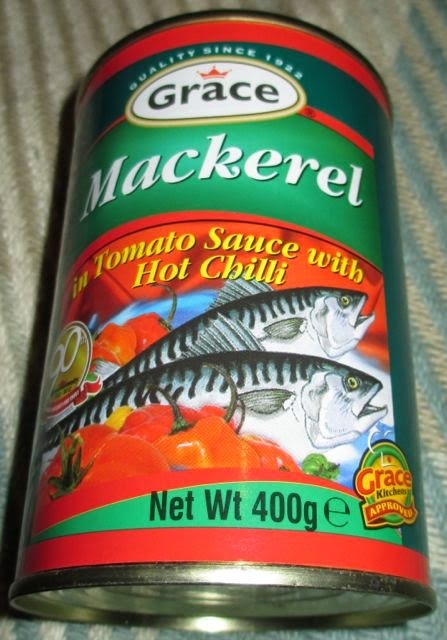 Ingredients included; mackerel (60%), tomato purée (5%), salt, modified maize starch, sugar, chilli powder (0.7%), wheat flour, vegetable oil, acetic acid, garlic, spices. Allergen information; contains gluten.